I think adulthood started for me around 2011. While I had lived out several years prior, 2011 was the year when the help decreased and I finished school. It was also the year when I missed Best Coast’s first Toronto gig as I was stuck working a Superbowl pub shift, but managed to catch them a month later in California. I have really fun memories driving around LA cranking crazy for you in the Dodge Caliber I rented singing IIIIIIIIII-WAAAAANNNNNT-YYYYYOUUUU-SOOOO-MUUUUCHH at the top of my lungs (see this video). Ahhh sweet memories. Hilarious google find when I was trying to locate the album cover of California Nights, I found Alvvays instead! 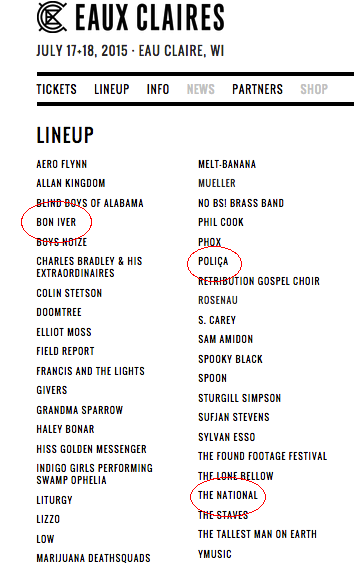 I was underwhelmed by Coachella and Sasquatch!’s offering’s this year, but with just two bands announced in the lineup Eaux Claires, crafted by Bon Iver’s Justin Vernon and The National’s Aaron Dessner, got me. TWO DAYS featuring the likes of BON IVER and THE NATIONAL. Alvvays, Modest Mouse, St Vincent, Timber Timbre.